Most car manufacturers tend to have a bread-and-butter line, and I don’t think many would argue that it is the 3-series for BMW. It’s what they sell the most of (by far), and for many, it’s considered the gateway drug. The 1-series is too small for some, and so the 3-series is the car that gets them into the BMW groove. The 2013 3-series is all-new, and the changes are significant compared to the last generation, which I reviewed and liked for the most part. It’s no cheap date, this one. 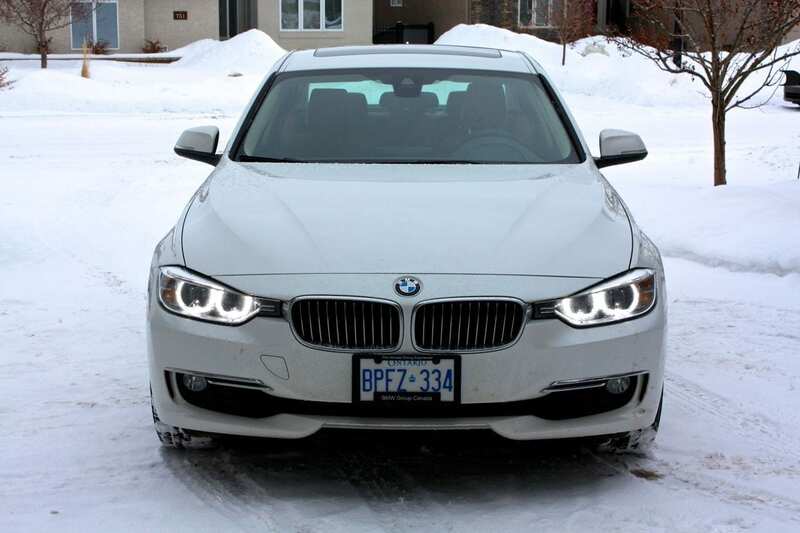 Although the 3-series starts at $35,900, you won’t have any issues checking off some, if not many, of those option boxes, and equipped as my 328i xDrive Luxury line review car was, it’ll cost you $52,950. 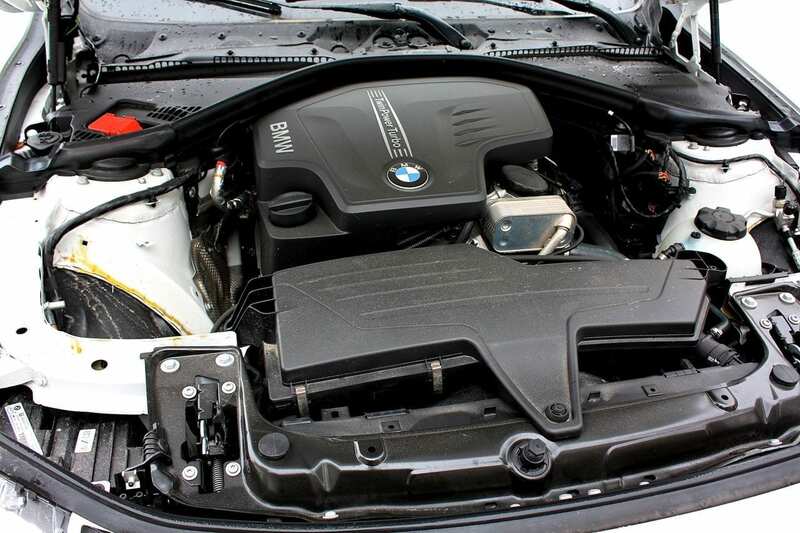 BMW’s 3-series has always been known for being available with a variation of their tremendous inline-6. It still is, in the upper-level 335i. But this “entry-level” 3 now comes with a turbocharged 2.0-Liter 4-cylinder engine. It has plenty of jam, putting out 241 horsepower at 5000 RPM and a fantastic 258 lb.ft of torque at a low, low 1250 RPM. 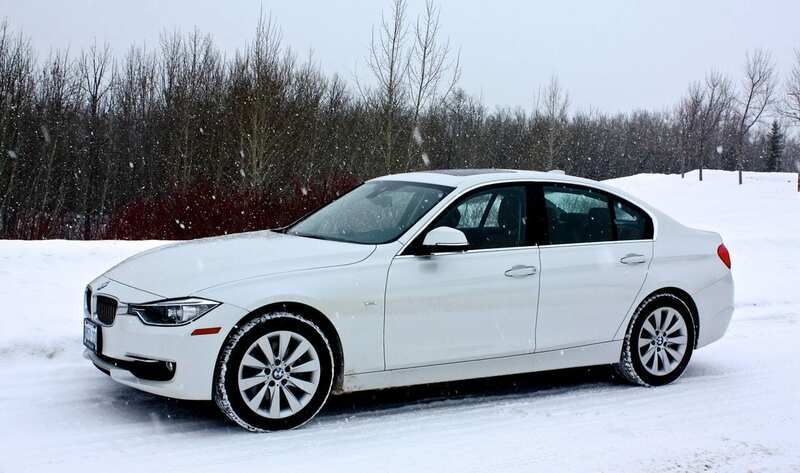 It makes its way through a new 8-speed automatic transmission – to all four corners via the xDrive system. Fuel economy is rated at 9.1 L/100 km (26 mpg) in the city, and 6.2 L/100 km (38 mpg) on the highway. I thought these ratings were fair, and probably not too far from realistic. Driving normally, including mostly city commuting and a few short freeway sprints netted me 10.8 L/100 km (22 mpg). 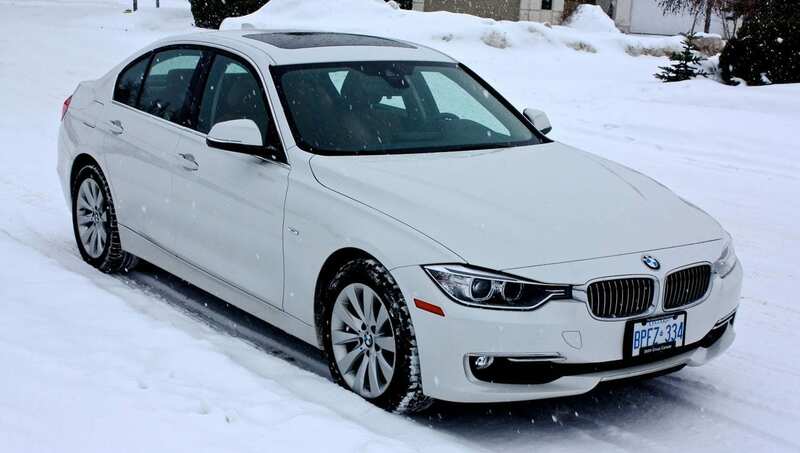 I also drove it with a heavy foot for a while, in cold weather, and in fresh snowfalls – having fun comes at a price but not one as steep as I expected – my fuel economy dropped to 12.4 L/100 km (19 mpg). The tank has a 60 Liter capacity. 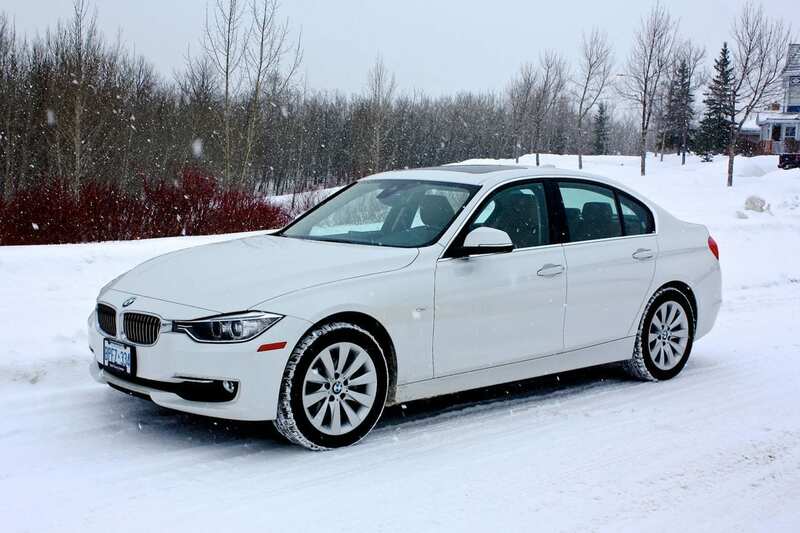 Although the 3-series design remains rooted in history, the evolution is clear. There’s no way anyone could mistake the iconic shape for anything else, but there is evidence of change everywhere you look. The vehicle is definitely taller and longer than the previous generation. You’ll notice the changes most at the front and at the back. I love how the kidney grille and the headlights come together to form what almost looks like a single unit now. The new driving lights are a cool strip of LEDs which look aggressive. Again, and I feel like I’m repeating myself here, the rear end will feel very familiar. But I found it to be considerably evolved toward the look of the current 5-series, especially in terms of the tail lights. 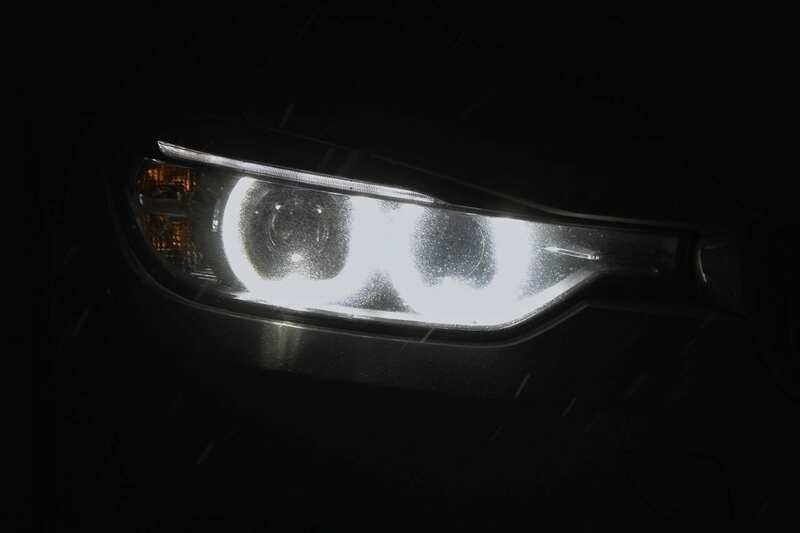 The headlights are very bright HIDs and during the day, the driving light halos are bright white. Overall, the car comes across as bigger and in my opinion, more mature. 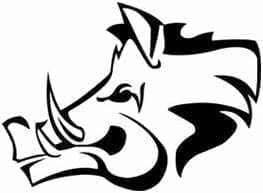 Although it retains a sporting character, the design seems to have grown up – whether you like it or not. The little 4-cylinder’s power is solid. Yes, there’s a tiny bit of lag until you’re under boost, but there’s plenty of responsiveness during everyday driving. 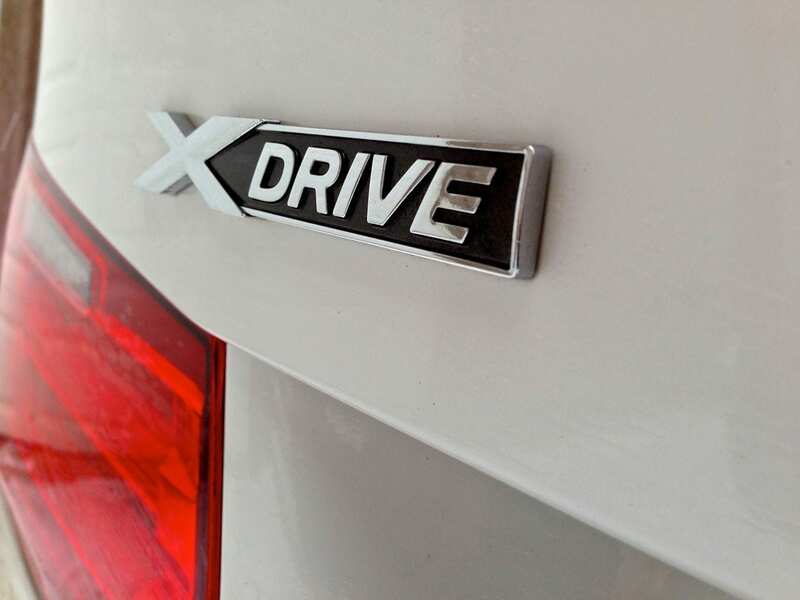 Acceleration is very good, and when pushed, the 328i xDrive will do the 0-100 km/h run in a very respectable 6.1 seconds. The engine itself is smooth, but the sounds it makes seem terribly unrefined compared to the mechanical symphony BMW’s inline-6s create. The transmission is always smooth and fast, and it felt pretty intelligent. It hunts for higher gears to save fuel, but you can put it into Sport mode to kick it up a notch. It’ll comply nicely, and hold shift points much longer. The shift lever does have a manual mode, allowing you to rock the lever forward or back to shift. A bit surprisingly, there are no shift paddles. The 328’s ride is firm, but less so than in the past – it’s certainly sporty enough and feels well-controlled, but it has an increased sense of comfort as well. In that vein, the handling is good, excellent even, but somehow, it doesn’t feel as immediate as the 3-series used to. It feels as though this line of cars is heading toward more comfort and luxury. Where the 3 has made gains in that department, it has given something up in terms of sport. Don’t get me wrong. It handles very well, it’s just different from what I’ve come to expect in a 3. One of those handling hallmarks from the past was the exceptional steering. Again, I felt as though BMW has made changes here, and to me, it felt number than I expected. 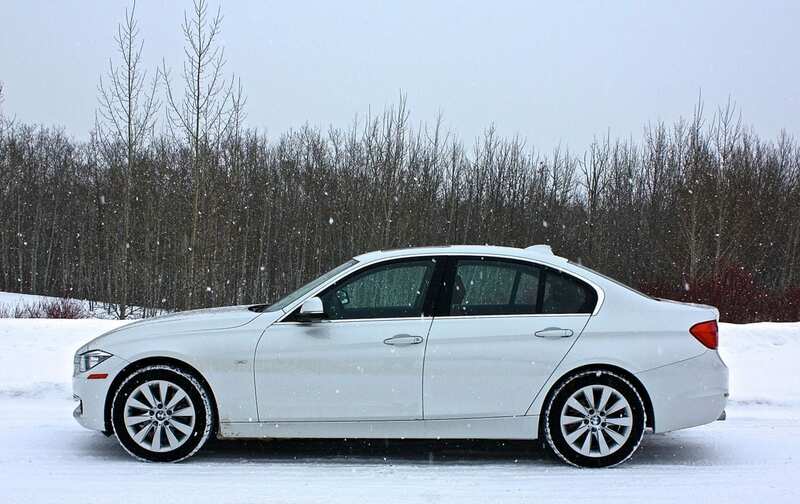 Especially from a 3-series where it was always beautifully weighted in the past. 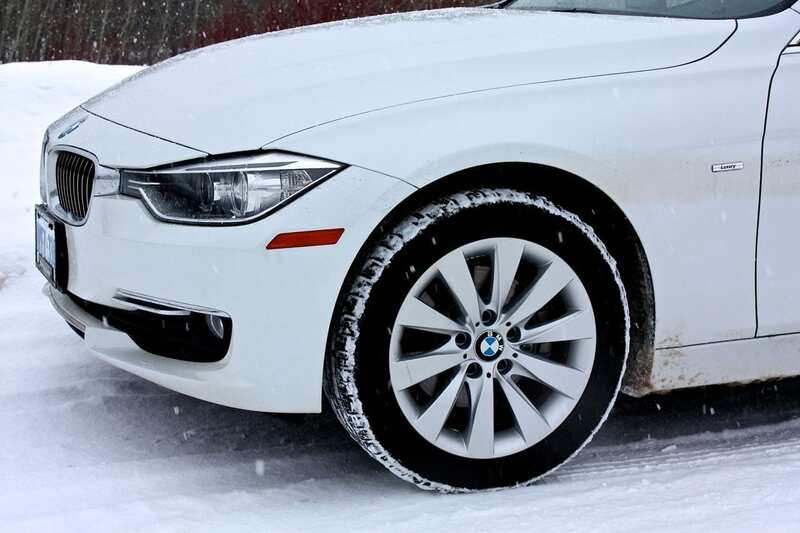 The xDrive all-wheel drive system was outstanding in most conditions, and it got tested well in a very snowy, slushy, slippery week of driving. I found the brakes to be very effective, so much so that they feel grabby at first. Visibility out of the car is very good, with excellent sight lines in every direction. Noise has been dampened well here, and other than the strange engine noises, things remained nice and quiet. The 328i has an auto start-stop function. It’s smooth when it shuts the engine down at a stop. But the second you release the brake, it fires up again, and I found it to be quite rough every time. A number of passengers commented on it as well, and I ended up turning that “feature” off, thank you very much. The traction control has two settings – one is Dynamic and the next level turns off all the electronic grannies. I really enjoyed the Dynamic setting as it allows you to have plenty of fun (especially in the snow) before it steps in. The first thing I noticed is that this car feels bigger inside compared to the last generation. And this interior is all new. Materials are very nice – you’ll find soft-touch, deluxe feeling materials everywhere, with upholstered, stitched goodies here and there as well as splashes of a handsome wood trim. 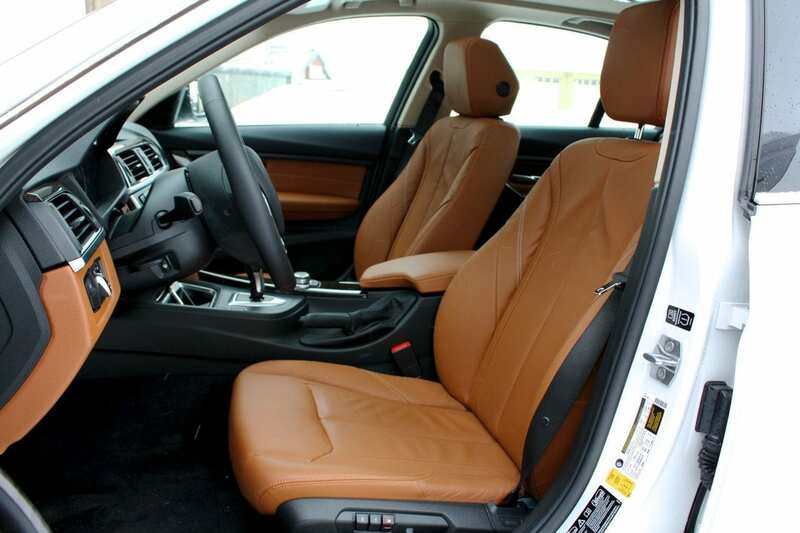 The Saddle Brown leather front seats are very comfortable, and they offer good bolstering as well – a nice combination of comfort and sport. They’re heated, and power adjustable. 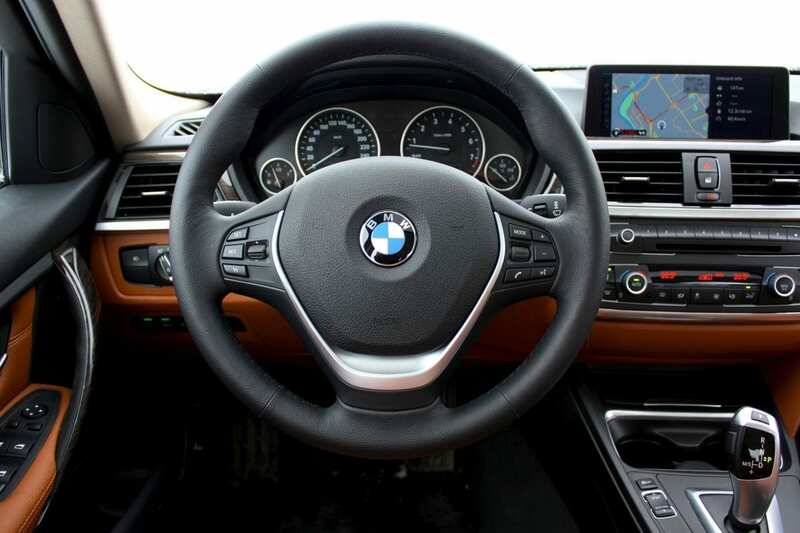 BMW makes great steering wheels – this one is heated, manually adjustable and has buttons for cruise control, handsfree/phone, and media functions. Behind it sit BMW’s typical two large gauges, with a trip computer below them offering details regarding your fuel economy, trip meters and on and on. I like the styling of the new dash, for the most part. The sculpting is interesting and the color combination here made it feel like the least business-like 3-series interior I’ve been in. The one thing I wasn’t too fond of was how the widescreen display simply juts out of the dash like a dorsal fin. It doesn’t seem to fit in, but in its defense, the screen is easy to read and that’s probably what matters more than styling on a day-to-day basis. Also the freestanding design of the screen, without a big bin in the dash to house it, makes the dash seem less bulky. 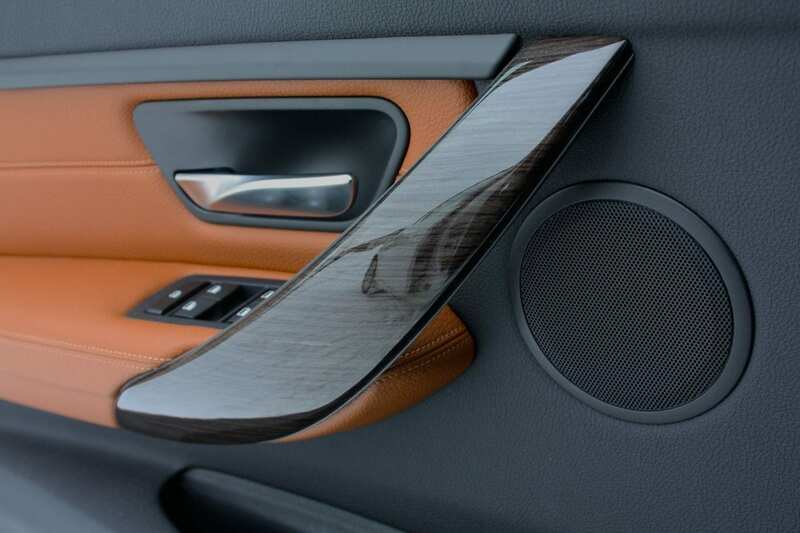 The screen itself is huge at 8.8 inches, and looks fantastic – it handles phone, navigation, vehicle settings and media functions – the sound system sounds fantastic. Below the screen is a set of very basic hard buttons for media control, and a well laid-out automatic dual-zone climate control system. 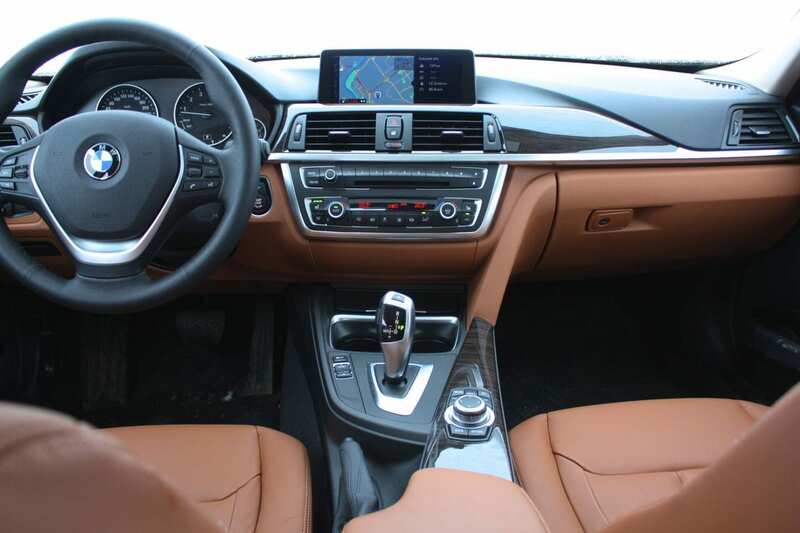 The center console has a typically German function – an ashtray and a lighter – as well as a couple of cupholders, BMW’s strange new joystick gear selector (which definitely takes some getting used to, but functions well once you get it) and of course, the iDrive interface. A few hard buttons leading you to major functions surround the iDrive controller, which is a rotary joystick button. I’m not a huge fan of iDrive, although it’s a significantly less drastic kick in the pants from what it used to be. The navigation around the screen and the sliding menus take some getting used to as well, but all in all, after some practice and patience, you’ll get it and it works fine. Everything is powered of course, including the tilt and slide sunroof overhead. Entry is keyless, and the ignition is a push-start. Driver tech is quite complete here – there’s blind-spot monitoring and lane departure warning as well as front-end collision monitoring. You also get a rear parking guide, where it will show you an outline of your car on the screen and where you’re getting close to something. Overall, the interior is well thought-out and nicely crafted, and has a premium feel to it. Back here, you’ll find three seats, three seatbelts and three headrests. As you’d expect, the middle seating position is laughable for anybody who has legs or is alive – it’s hard, narrow and straddles a very tall floor tunnel. Thankfully the outboard seating positions are lovely, providing reasonably comfortable and heated seats. I say reasonably, as I found the rear seats to be quite firm. 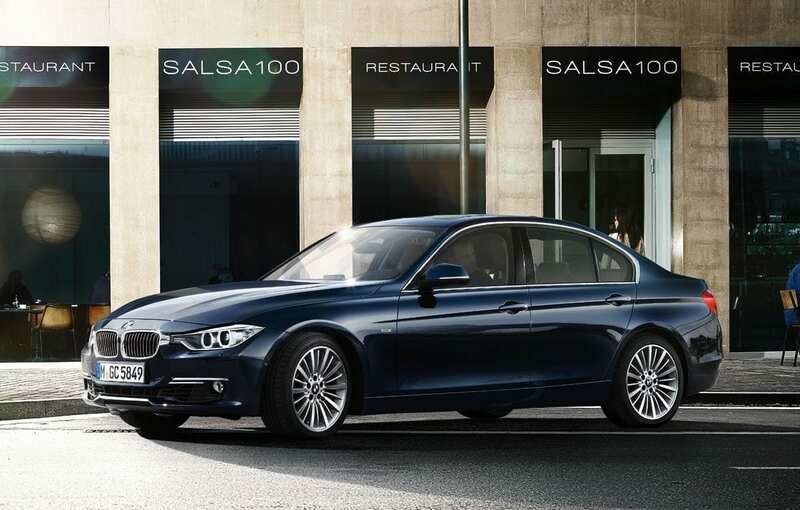 One of the advantages of the increased size of the 3-series is the space in the back seat. It feels more roomy, and the headroom is good for someone my size – I’m 5’10”. The leg room is also good, paired with excellent foot space under the front seats. If you have long legs, you may find the hard front seatbacks uncomfortable and a bit unforgiving. We had our three kids back there, and they were just fine with the space, and there are two sets of anchors for their seats if you need them. In terms of goodies, you do get 12V plug as well as adjustable air vents, but there are no seatback storage pockets. I really liked the rear dome lighting – it was thoughtful in that you get a great main light back there, as well as excellent separately controlled reading lights. The middle seatback folds down to become an armrest and it has a couple of goofy, clumsy cupholders in it. There’s a nicely upholstered armrest that pops open to provide you with a barely usable, shallow compartment and access to the USB and auxiliary plugs. 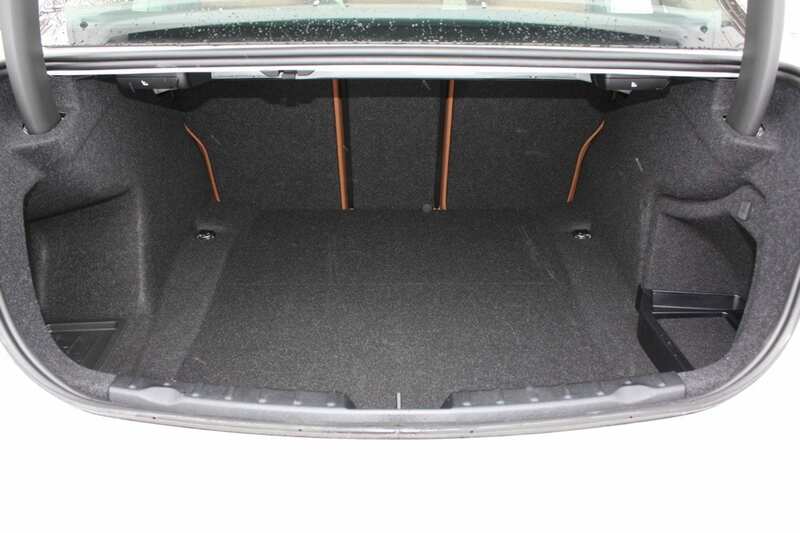 The glove compartment is small but usable, and the door bins, while shallow, are decent. 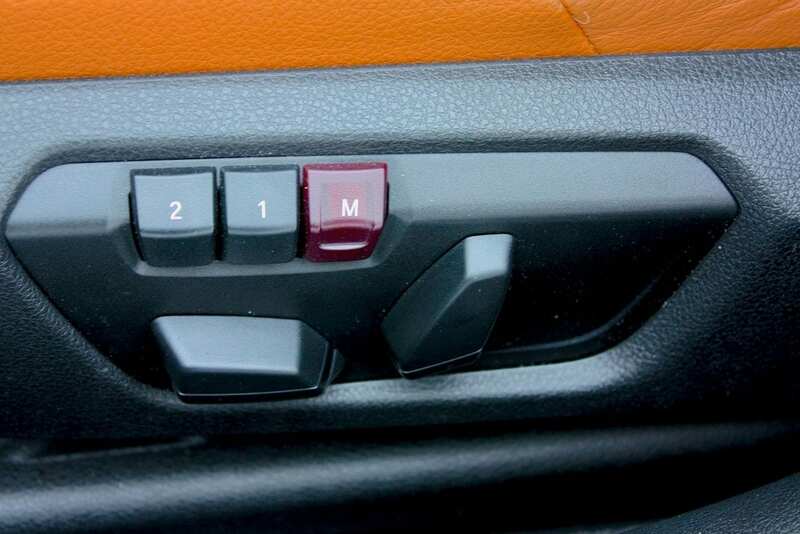 You can open your trunk lid from inside the cabin, from your key FOB and with a release button on the lid. The trunk is big enough at 17 cubic feet (481 Liters) and nicely finished. The trunk lid arms are shrouded, and that makes for a nice clean appearance and won’t end up pinching any of your cargo/luggage. The rear seats split 40/40/20, which maximizes the flexibility back there, and there is a nice pass-through in the middle. Fold them all down, and your cargo capacity jumps up considerably. BMW makes a big deal out of their “Efficient Dynamics” thing, which apparently is all about being efficient. So much so that their little traditional instant fuel economy gauge with the swinging needle (which is now digital and part of a lovely display screen) has a section off to the left, where (when your car is stopped, or you’re coasting) the “needle” will head into a blue territory and show a battery. If I didn’t know any better, I’d almost think they’re trying to fool the driver into thinking it’s doing something like a hybrid does when it’s charging it’s battery. But it’s not a hybrid, and any charging it’s doing there will have little or no impact on your fuel economy. I found it a bit dumb. Just show me I’m using 0 L/100 km – that will make me happy enough. 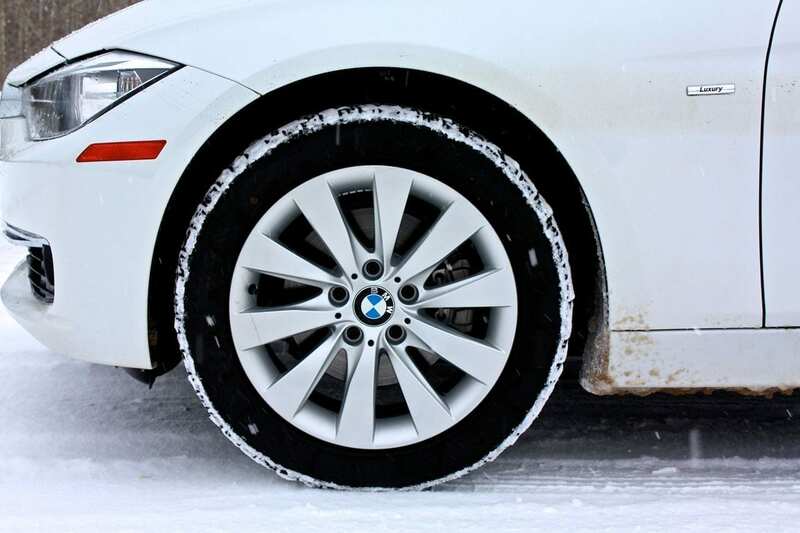 If you know your BMWs, you’ll know they like to bend you over when it comes to the options. And that irks me when it comes to things that should be standard equipment. Want some examples? Well, the alarm system is an option. Oh, you want satellite radio? Yep, it’s an option. 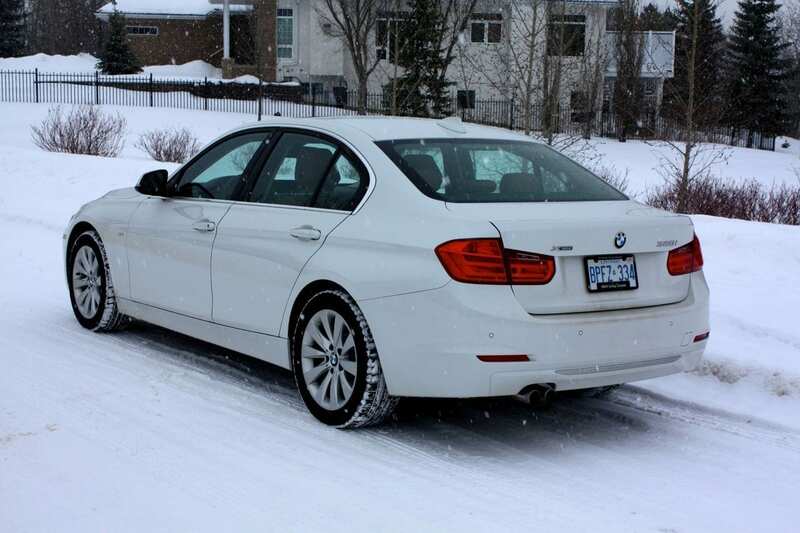 My review car was the Luxury line, and BMW has fit the cowl with a big “Luxury” badge. Seriously. It says “Luxury”. I thought it looked pretty lame and cheap. I enjoyed, and others commented on, the LED lights in the door handles that shine down to light the side of the car when it’s unlocked. It looks great and it’s useful. The new 3-series is darn tootin’ nice ride. There is much to like, and standing on its own, it’s a fantastic vehicle. The changes on the outside are nice, and the revised interior is better in virtually every way, including the welcome increase in size. I found it to be lacking some of the sharper edges of the sporty blade it used to wield, but it makes up for that in comfort. It just depends if that’s what you’re looking for. There are other trim lines too, one of them being Sport. That might be the answer for some. The 3 is luxurious, well put-together, relatively efficient and a joy to drive. It’s responsive, agile and balanced on the road. 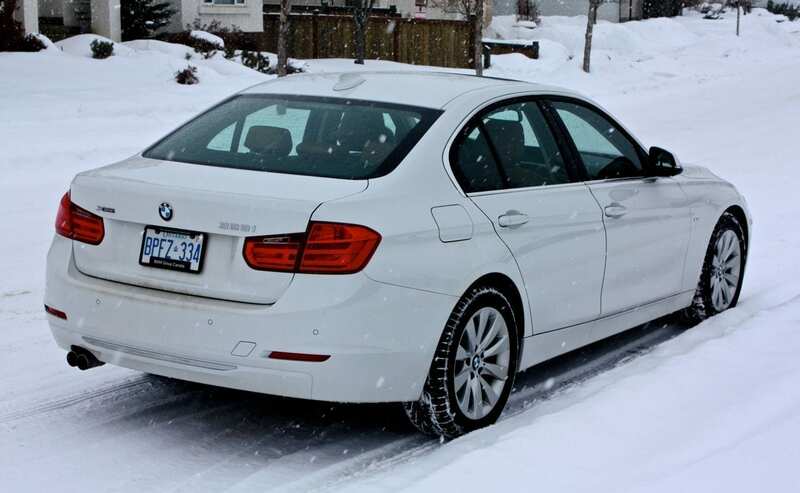 I give the new 328i xDrive an 8 out of 10. WAF (Wife Acceptance Factor) was here and there. She loved the styling – inside and out. She really liked the all-wheel drive and how it just worked, and she enjoyed the feel of luxury in the cabin. She absolutely hated the iDrive interface and she thought the engine sounded a bit like a diesel at certain RPMs. After she said that, I tested the theory and I found I had to agree. 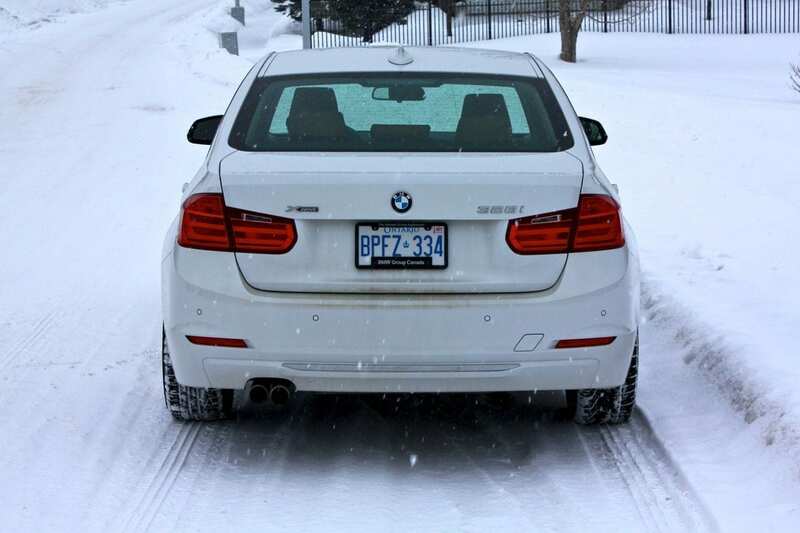 There is no question that the 3-series will continue to be a best-seller. All the ingredients are here, and as in the past, you can’t blame people for considering this car the category’s benchmark. The fact that the competition has started aiming for the 3-series has pushed BMW to make great improvements. It will be interesting to see what the competition brings to the table.